The XVis project brings together the key elements of research to enable scientific discovery at extreme scale. Scientific computing will no longer be purely about how fast computations can be performed. Energy constraints, processor changes, and I/O limitations necessitate significant changes in both the software applications used in scientific computation and the ways in which scientists use them. Components for modeling, simulation, analysis, and visualization must work together in a computational ecosystem, rather than working independently as they have in the past. This project provides the necessary research and infrastructure for scientific discovery in this new computational ecosystem by addressing four interlocking challenges: emerging processor technology, in situ integration, usability, and proxy analysis. Emerging Processor Technology One of the biggest recent changes in high-performance computing is the increasing use of accelerators. Accelerators contain processing cores that independently are inferior to a core in a typical CPU, but these cores are replicated and grouped such that their aggregate execution provides a very high computation rate at a much lower power. Current and future CPU processors also require much more explicit parallelism. Each successive version of the hardware packs more cores into each processor, and technologies like hyperthreading and vector operations require even more parallel processing to leverage each core’s full potential. 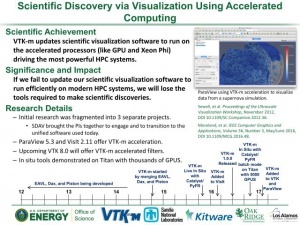 XVis brings together collaborators from the predominant DOE projects for visualization on accelerators and combines their respective features in a unified visualization library named VTK-m. VTK-m will allow the DOE visualization community, as well as the larger visualization community, a single point to collaborate, contribute, and leverage massively threaded algorithms. 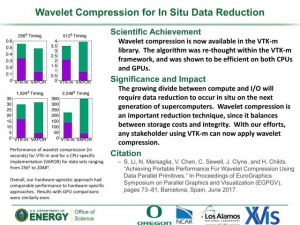 The XVis project is providing the infrastructure, research, and basic algorithms for VTK-m, and we are working with the SDAV SciDAC institute to provide integration and collaboration throughout the Office of Science. In Situ Integration Fundamental physical limitations prevent storage systems from scaling at the same rate as our computation systems. Although large simulations commonly archive their results before any analysis or visualization is performed, this practice is becoming increasingly impractical. Thus, the scientific community is turning to running visualization in situ with simulation. This integration of simulation and visualization removes the bottleneck of the storage system. Integrating visualization in situ with simulation remains technically difficult. XVis leverages existing in situ libraries to integrate flyweight techniques and advanced data models to minimize resource overhead. 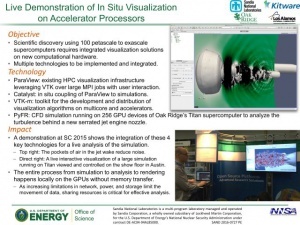 Within our in situ visualization tools, XVis integrates existing visualization algorithms and those incorporating emerging processor technology. XVis also studies the latest techniques for new domain challenges and for post hoc interaction that reconstructs exploratory interaction with reduced data. Usability A significant disadvantage of using a workflow that integrates simulation with visualization is that a great deal of exploratory interaction is lost. Post hoc techniques can recover some interaction but with a limited scope or precision. Little is known about how these limitations affect usability or a scientist’s ability to form insight. XVis performs usability studies to determine the consequences of in situ visualization and proposes best practices to improve usability. Unlike a scalability study, which is always quantitative, XVis’ usability studies are mostly qualitative. Our goal is not to measure user performance; rather, we want to learn about the limitations and benefits of incorporating in situ methods in scientists’ workflows. These studies reveal how the simulation, hardware, and users respond to a particular design and setting. Proxy Analysis The extreme-scale scientific-computation ecosystem is a much more complicated world than the largely homogeneous systems of the past. There is significantly greater variance in the design of the accelerator architecture than is typical of the classic x86 CPU. In situ visualization also yields complicated interactions between the simulation and visualization that are difficult to predict. Thus, the behavior observed in one workflow might not be indicative of another. To better study the behavior of visualization in numerous workflows on numerous systems, XVis builds proxy applications that characterize the behavior before the full system is run. We start with the design of mini-applications for prototypical visualization operations and then combine these with other mini-applications to build application proxies that characterize the behavior of larger systems. The proxy analysis and emerging processor technology work are symbiotic. The mini-applications are derived from the VTK-m implementations, and the VTK-m design is guided by the analysis of the mini-applications. Acknowledgements This work is supported by the DOE Office of Science (Office of Advanced Scientific Computing Research). Sandia National Laboratories is a multi-program laboratory managed and operated by Sandia Corporation, a wholly owned subsidiary of Lockheed Martin Corporation, for the U.S. Department of Energy’s National Nuclear Security Administration under contract DE-AC04-94AL85000. "Scalable Visualization of Time-varying Multi-parameter Distributions Using Spatially Organized Histograms." T. Neuroth, F. Sauer, W. Wang, S. Ethier, C. S. Chang and K. L. Ma. IEEE Transactions on Visualization and Computer Graphics, 23(12), 2599-2612, December 2017. DOI 10.1109/TVCG.2016.2642103. "In situ Visualization in Radiation Transport using VTK-m." Mark Kim, Tom Evans, Scott Klasky, David Pugmire. Workshop on In Situ Analysis and Visualization (ISAV), November 2017 (to appear). "A Combined Eulerian-Lagrangian Data Representation for Large-Scale Applications." F. Sauer, J. Xie, and K. L. Ma. IEEE Transactions on Visualization and Computer Graphics, 23(10), 2248-2261, October 2017. DOI 10.1109/TVCG.2016.2620975. "Maximal Clique Enumeration with Data-Parallel Primitives." Brenton Lessley, Talita Perciano, Manish Mathai, Hank Childs, and E. Wes Bethel. In Proceedings of the IEEE Symposium on Large Data Analysis and Visualization (LDAV), October 2017. "Techniques for Data-Parallel Searching for Duplicate Elements." Brenton Lessley, Kenneth Moreland, Matthew Larsen, and Hank Childs. In Proceedings of the IEEE Symposium on Large Data Analysis and Visualization (LDAV), October 2017. "Spatio-Temporal Feature Exploration in Combined Particle/Volume Reference Frames." F. Sauer and K. L. Ma. IEEE Transactions on Visualization and Computer Graphics, 23(6), 1624-1635, June 2017. DOI 10.1109/TVCG.2017.2674918. "Achieving Portable Performance for Wavelet Compression Using Data Parallel Primitives." Shaomeng Li, Nicole Marsaglia, Vincent Chen, Christopher Sewell, John Clyne, and Hank Childs. In Eurographics Symposium on Parallel Graphics and Visualization (EGPGV), June 2017. DOI 10.2312/pgv.20171095. "Preparing for In Situ Processing on Upcoming Leading-edge Supercomputers," J. Kress, R. Churchill, S. Klasky, M. Kim, H.Childs, D. Pugmire, Supercomputing Frontiers and Innovations, December, 2016. DOI http://dx.doi.org/10.14529/jsfi160404. "Audience-Targeted Design Considerations for Effective Scientific Storytelling." F. Sauer, T. Neuroth, J. Chu and K. L. Ma. Computing in Science & Engineering, 18(6), 68-76, November/December 2016. DOI 10.1109/MCSE.2016.100. 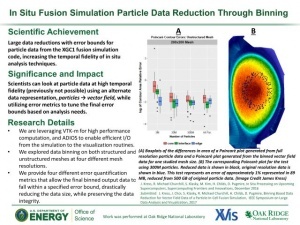 "Visualization and Analysis Requirements for In Situ Processing for a Large-Scale Fusion Simulation Code." James Kress, David Pugmire, Scott Klasky, and Hank Childs. In SC16 Workshop on In Situ Analysis and Visualization (ISAV), November 2016. DOI 10.1109/ISAV.2016.014. "Optimizing Multi-Image Sort-Last Parallel Rendering." Matthew Larsen, Kenneth Moreland, Chris Johnson, and Hank Childs. In Proceedings of the IEEE Symposium on Large Data Analysis and Visualization (LDAV), October 2016. DOI 10.1109/LDAV.2016.7874308. 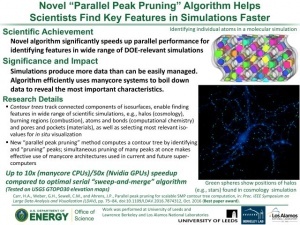 "Parallel Peak Pruning for Scalable SMP Contour Tree Computation." Hamish Carr, Gunther Weber, Christopher Sewell, and James Ahrens. In Proceedings of the IEEE Symposium on Large Data Analysis and Visualization (LDAV), October 2016. DOI 10.1109/LDAV.2016.7874312. 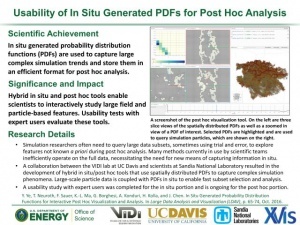 "In Situ Generated Probability Distribution Functions for Interactive Post Hoc Visualization and Analysis." Yucong Ye, Tyson Neuroth, Franz Sauer, Kwan-Liu Ma, Giulio Borghesi, Aditya Konduri, Hemanth Kolla, and Jacqueline Chen. In Proceedings of the IEEE Symposium on Large Data Analysis and Visualization (LDAV), October 2016. DOI 10.1109/LDAV.2016.7874311. "Parallel Distributed, GPU-Accelerated, Advanced Lighting Calculations for Large-Scale Volume Visualization." Min Shih, Silvio Rizzi, Joseph Insley, Thomas Uram, Venkatram Vishwanath, Mark Hereld, Michael E. Papka, and Kwan-Liu Ma. In Proceedings of the IEEE Symposium on Large Data Analysis and Visualization (LDAV), October 2016. DOI 10.1109/LDAV.2016.7874309. "Hybrid Data-Parallel Contour Tree Computation." Hamish Carr, Christopher Sewell, Li-Ta Lo, and James Ahrens. In Proceedings of the Computer Graphics and Visual Computing Conference, September 2016. DOI 10.2312/cgvc.20161299. "External Facelist Calculation with Data-Parallel Primitives." Brenton Lessley, Roba Binyahib, Robert Maynard, and Hank Childs. In Eurographics Symposium on Parallel Graphics and Visualization (EGPGV), June 2016. DOI 10.2312/pgv.20161178. 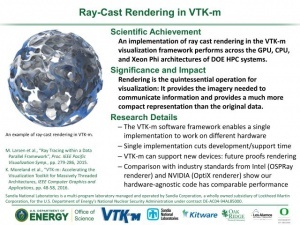 "VTK-m: Accelerating the Visualization Toolkit for Massively Threaded Architectures." Kenneth Moreland, Christopher Sewell, William Usher, Li-ta Lo, Jeremy Meredith, David Pugmire, James Kress, Hendrik Schroots, Kwan-Liu Ma, Hank Childs, Matthew Larsen, Chun-Ming Chen, Robert Maynard, and Berk Geveci. IEEE Computer Graphics and Applications, 36(3), May/June 2016. DOI 10.1109/MCG.2016.48. "An Integrated Visualization System for Interactive Analysis of Large, Heterogeneous Cosmology Data." Annie Preston, Ramyar Ghods, Jinrong Xie, Franz Sauer, Nick Leaf, Kwan-Liu Ma, Esteban Rangel, Eve Kovacs, Katrin Heitmann, Salman Habib. In Proceedings of IEEE PacificVis, April 2016. DOI 10.1109/PACIFICVIS.2016.7465250. "The Tensions of In Situ Visualization." Kenneth Moreland. IEEE Computer Graphics and Applications, 36(2), March/April, 2016, pg. 5–9. DOI 10.1109/MCG.2016.35. "Visualization Techniques for Studying Large-Scale Flow Fields from Fusion Simulations." Franz Sauer, Yubo Zhang, Weixing Wang, Stéphane Ethier, Kwan-Liu Ma, Computing in Science and Engineering, 18(2), 68–77, March/April 2016. DOI 10.1109/MCSE.2015.107. 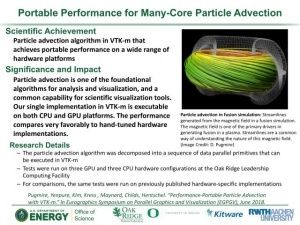 "Visualization for Exascale: Portable Performance is Critical." Kenneth Moreland, Matthew Larsen, and Hank Childs. Supercomputing Frontiers and Innovations, 2(3), 2015. DOI 10.14529/jsfi150306. "ParaView Catalyst: Enabling In Situ Data Analysis and Visualization." Utkarsh Ayachit, Andrew Bauer, Berk Geveci, Patrick O'Leary, Kenneth Moreland, Nathan Fabian, Jeffrey Mauldin. In Proceedings of the First Workshop on In Situ Infrastructures for Enabling Extreme-Scale Analysis and Visualization (ISAV 2015), November 2015. pp. 25-29. DOI 10.1145/2828612.2828624. "Integrated explorer for cosmological evolution." Annie Preston, Franz Sauer, Ramyar Ghods, Nick Leaf, Jinrong Xie, Kwan-Liu Ma, In IEEE Scientific Visualization (SciVis), 107–114, October 2015. DOI 10.1109/SciVis.2015.7429499. "Volume rendering with data parallel visualization frameworks for emerging high performance computing architectures." 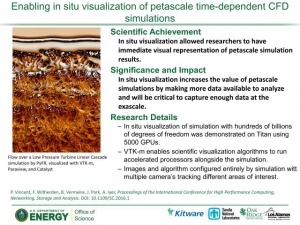 Hendrik A. Schroots, Kwan-Liu Ma, In SIGGRAPH Asia Visualization in High Performance Computing, 3:1–3:4, November 2015. DOI 10.1145/2818517.2818546. "High performance heterogeneous computing for collaborative visual analysis." Jianping Li, Jia-Kai Chou, Kwan-Liu Ma, In SIGGRAPH Asia Visualization in High Performance Computing, 12:1–12:4, November 2015. DOI 10.1145/2818517.2818534. 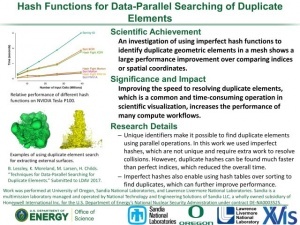 "Scalable Parallel Distance Field Construction for Large-Scale Applications." Hongfeng Yu, Jinrong Xie, Kwan-Liu Ma, Hemanth Kolla, Jacqueline H. Chen, IEEE Transactions on Visualization and Computer Graphics, 21(10), 1187–1200, October 2015. DOI 10.1109/TVCG.2015.2417572. "In situ depth maps based feature extraction and tracking." Yucong Chris Ye, Yang Wang, Robert Miller, Kwan-Liu Ma, Kenji Ono, In Large Scale Data Analysis and Visualization (LDAV), 1–8, October 2015. DOI 10.1109/LDAV.2015.7348065. "Fast uncertainty-driven large-scale volume feature extraction on desktop PCs." Jinrong Xie, Franz Sauer, Kwan-Liu Ma, In Large Scale Data Analysis and Visualization (LDAV), 17–24, October 2015. DOI 10.1109/LDAV.2015.7348067. "Scalable visualization of discrete velocity decompositions using spatially organized histograms." Tyson Neuroth, Franz Sauer, Weixing Wang, Stéphane Ethier, Kwan-Liu Ma, In Large Scale Data Analysis and Visualization (LDAV), 65–72, October 2015. DOI 10.1109/LDAV.2015.7348073. This page was last modified on 19 September 2018, at 17:58.